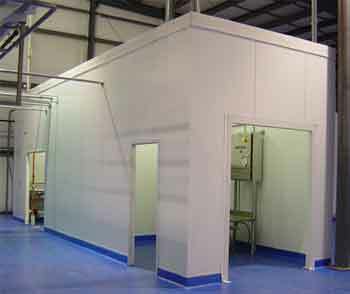 Modular Prefabricated Environmental Enclosures & Buildings. As more and more businesses turn to high tech methods of production, it has become increasingly important to be able to isolate certain parts of the production process using environmental enclosures. These units provide a self contained area within an industrial facility or other building where sensitive processes can be carried out safely. 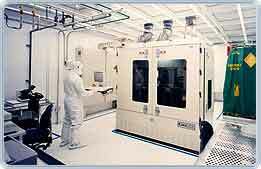 Whether your business specializes in producing high tolerance electrical components that must be assembled in a clean environment without dust or dirt, or you need to create an area where toxic chemicals can be used without the risk of escape into the wild, an environmental enclosure or clean room is an essential part of your building. In its simplest form, an environmental enclosure is simply a room within a building where the operators have a great deal of control over all factors that affect the interior. From specifying an optimum temperature through to setting ideal humidity and dust levels for a process to be carried out, an environmental clean room offers your business the best option for keeping sensitive systems running at maximum efficiency. Installing an environmental enclosure within your building is a straightforward process, although it is generally more costly than implementing a similar sized office block, even when modular components are used. There is generally a fair amount of infrastructure needed to support the operation of the environmental enclosure in the form of air conditioning ducts, de humidifiers, and powered air filters to prevent things from getting in or out. Certain business types require a much more controllable environmental enclosure in which work can be carried out. A room that offers the ability to prevent any escape of chemicals is required when working with certain pharmaceutical techniques, while minimizing the entry of dust into components is a key way of improving the way in which delicate and sensitive electronic components are produced. When a modular technique is used for the installation of a clean room on your premises, you get a number of benefits. Firstly, all of the systems such as air, electricity and water are built into the actual room, trunking is included within the walls, and they are designed to fit together with a good seal to prevent any escapes. Thanks to the modular nature of the construction of these environmental enclosures, it is entirely possible to adapt and change the clean room over time as your needs change. Walls can simply be shifted around and rebuilt to the new specifications in a matter of days, allowing your environmental room to always incorporate the needs of your business within its sealed walls. Choosing the right environmental enclosure for the needs of your business relies on you being completely certain about what you need. Thankfully, when it is the time to order the room, an expert will be on hand to run through all of the available options and how they will impact on the running and operation of the enclosure. This will ensure that the system is ideal for your needs. Easy Rack carries a wide variety of commercial shelving, material handling equipment, commercial lighting, used pallet racks, and modular prefab buildings installed nationwide. If you can not find what you are looking for call us toll free at 1-888-776-3720 and we will find it for you. Our home office is located in Houston, Texas with warehouses located throughout the United States that enable us to service all 50 states including New Orleans, La., Cleveland, Ohio, Kansas City, Mo., Mesa, Arizona, Virginia Beach, Va., Omaha, Nebraska, Oakland, California, Miami, Florida, Tulsa, Oklahoma, Minneapolis, Minnesota, Colorado Springs, Colorado, Arlington, Texas, Beaumont, Texas, Denton, TX, McKinney, Texas, Midland, TX, Killeen, Texas.